I find it somewhat hard to believe that I haven’t read Fahrenheit 451 until now. In addition to its status as a classic, it would seem that, given, my chosen profession, I’d have managed to read it already. As the above quote illustrates, the message of this book should appeal to librarians. Before I started reading this book, I was familiar with the general premise, a dystopian future in which books are outlawed. The book’s protagonist is Guy Montag, who works as a fireman. In this future society, firemen don’t put out fires; they set them, in order to burn illicit books. Montag becomes increasingly dissatisfied with the state of the society in which he lives, and he takes steps to oppose the status quo. The particular audiobook I am listening to is narrated very well by actor Tim Robbins, which adds to my enjoyment. Robbins does a great job of bringing Montag to life and provides distinguishable, believable voices for the supporting characters. Bradbury, Ray. 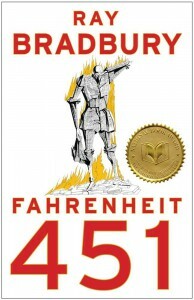 Fahrenheit 451. Newark, NJ: Audible Studios, 2014. Interesting to note is that F451 would only warm up a book not burn it. Celsius 451 is what would burn it.